Legend has it that the prison fare on the Eastern seaboard in the 1800’s was lobster, because it was plentiful and cheap. Prisoners begged the warden for a change of menu. Today, lobster is a luxury and is considered a delicacy. The perception has changed and it is usually one of the most expensive items on a menu. Here is some social currency on the subject of lobsters that you can share, as a luxury real estate marketing professional, when you take a client out to lunch or dinner. Lobster shells are usually a blend of three colors, red yellow and blue. 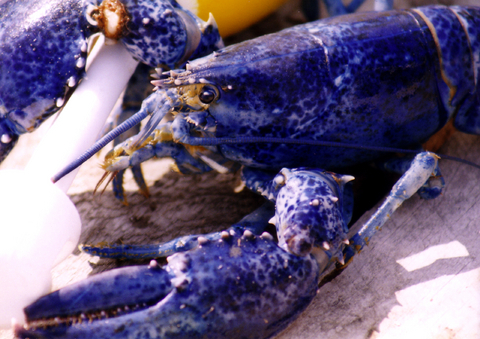 One in two million lobsters is blue because it produce extra protein due to a genetic anomaly. One is 30 million lobsters are yellow. An half yellow, half brown lobster resides in an oceanarium in Maine. One in 100 million lobsters is albino. An albino lobsters is known as a crystal lobster. The European lobster has a blue tipped tail and legs, and some have variegated coloring. The West Coast is home to the Spiny Lobster, also known as langouste or rock lobster. Unlike their Maine cousins (considered to be true lobsters) they do not have claws. In our area, the central California Coast, the lobster season is between October and March. The meat is very sweet and they are absolutely delicious! The sea birds agree, as we often see discarded lobster shells on the beach this time of the year.